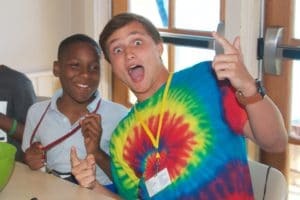 Camp Hope 2019 Registration is OPEN! Sign up TODAY! Kidz2Leaders provides stability, opportunity and a Christian community for children of inmates to break the cycle of incarceration. Having a parent in prison is listed as one of the top Adverse Childhood Experiences, according to the Centers for Disease Control (CDC). Our decade-long continuum of programming guides these children toward a life of self-sufficiency, joy, and success at no cost to their families. Nearly 200,000 children in Georgia have an incarcerated parent. Up to 70 percent of children of inmates may one day become incarcerated. Georgia’s prison expenditures total more than $1 billion annually. Ninety-nine percent of Kidz2Leaders graduates are living free from state or federal incarceration. In 2018, more than 500 volunteers gave a total of 23,500 volunteer hours to Kidz2Leaders to directly serve 325 children and family members. Since 1999, our programs have impacted more than 1,300 campers, siblings, parents, guardians, and relatives. We are so excited to announce that we will have three weeks of Camp Hope this summer! We need more volunteers than ever, SO SIGN UP TODAY! Campers, register NOW to reserve your place his summer. Click on the photo below to read more. Get your foursome registered for a beautiful day of golf at Atlanta Country Club on Monday, May 20, 2019. We are excited to announce that a third week of Camp Hope has been added to serve even more children of inmates, so your support is really appreciated! New this year, the tournament TIME has changed - Shotgun start is now at NOON, with registration starting at 10:30 am. Box lunches will be provided and a reception will follow the tournament where all contest winners will be announced. 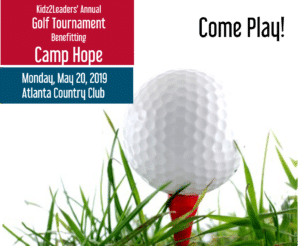 … Read More about Kidz2Leaders’ Annual Golf Tournament benefiting Camp Hope – Register NOW!